A typical student's view inside the Big House. But Brandon did away with that in 2013, with his new general admission seating policy. Instead of seating the students by class, it was first come, first served. The students stayed away in droves. 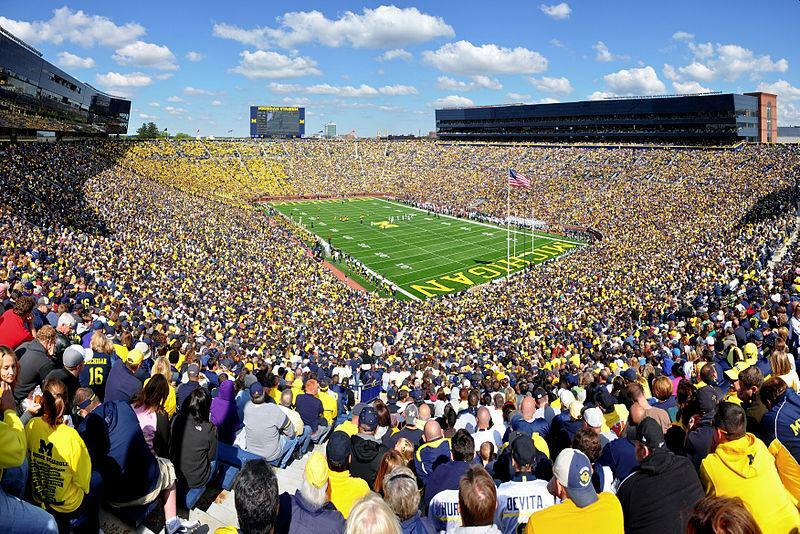 TV cameras used to love blimp shots of the sold-out Big House – and now they don't show any. And to add insult to injury: college teams now play their biggest rivalry game on Thanksgiving weekend, when the students are gone. If the students don’t love college football now, when it’s half-price, will they love it more when they’re paying twice that, plus a Personal Seat License? “We all think of every home Michigan football game like a miniature Super Bowl,” said Brandon. I don’t know any Michigan fans who think that. Quite the opposite, they think Michigan games are the antidote for the artificial excess of the NFL. They love the traditions, the rituals, and the rivalries, the timeless elements that separate the sport from the NFL, and get passed down to the next generation. Survey after survey points the finger for low attendance not at high-definition TV or poor cell-phone service, but squarely at the athletic department's decisions. Only 9% of Michigan football season ticket holders have season tickets for any professional team. If that’s true, maybe Michigan should stop showing ads between the action, and give fans the marching band instead. They can get TV ads at home. They can only get the band at the Big House. Survey after survey points the finger for low attendance not at high-definition TV or poor cell-phone service, but squarely at the athletic department’s decisions. Fans are fed up of paying steakhouse prices for junk food opponents, then sitting through ads for $9,000 corporate receptions at Michigan Stadium. The more they cater to TV, the more fans get turned off. Is that really what Michigan is all about? Fly-overs, blaring rock music, and Beyonce? Beyonce is to Michigan football what Bo Schembechler is to – well, Beyonce. No, Michigan is all about loyal fans who’ve been coming together for decades to leave a bit of the modern world behind – and the incessant marketing that comes with it – and share an authentic experience fueled by the passion of the team, the band and the students. That’s it. Yes, the department has always followed business practices, but it has never been run strictly as a business – until now. The proof is the wait list, which former athletic director Don Canham grew to some 30,000 fans. If he wanted to “maximize revenue,” he would have increased the price to meet demand. But he didn’t, because he believed that would dispel the magic. The wait list is long gone. Tickets used to be undervalued, and you knew that when you scalped them. Now they’re overvalued, and you know that when you try to sell them through Michigan’s Official Scalper, Stubhub. This fall Michigan might break its string of 100,000-plus crowds for the first time since 1975. Treat your fans like customers, and they’ll behave that way, reducing their irrational love for their team to a cool-headed, dollars-and-cents decision to buy tickets, with all the emotion of buying new tires. You have to give him credit: he has delivered on his promise.